Mango season is on and its almost a daily routine to make something or the other using Mango. 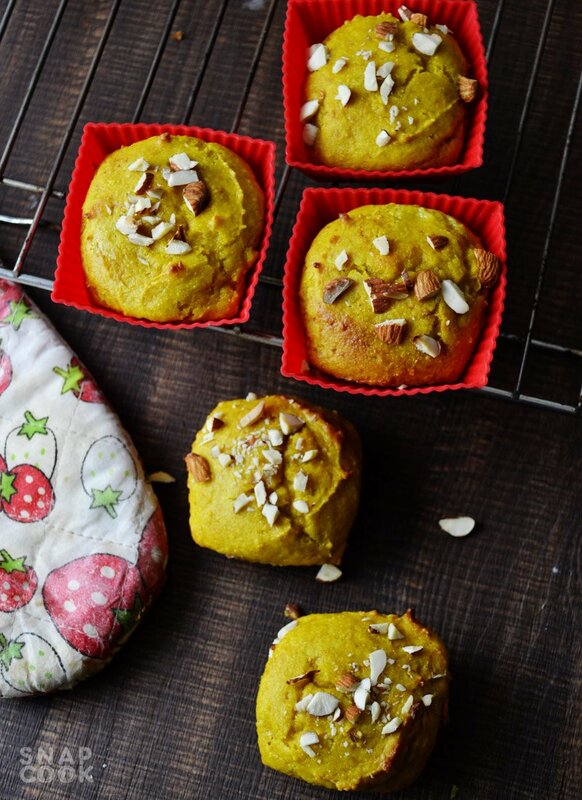 So today we will be making Mango muffins for kids. For this we will be using fresh mango pulp instead of market available tin pulp. 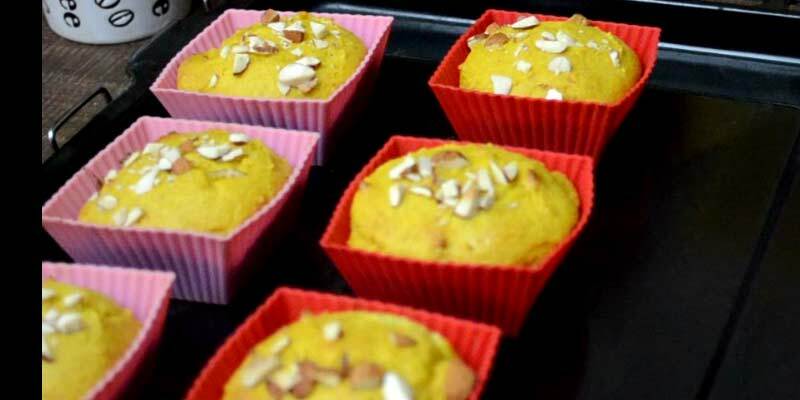 using no eggs (egg less) for these muffin recipe. So here is the list of items we need to the muffins. Butter – 1/8 cup or 20 grams. Granulated Sugar – ½ cup. 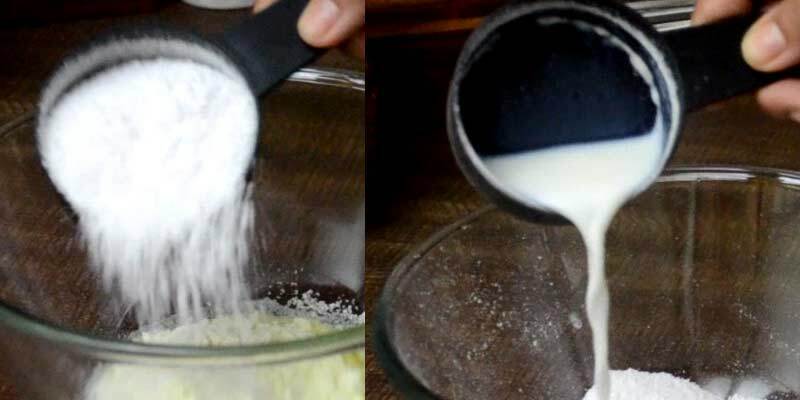 Milk – 1 tablespoon + ¼ cup. Whole-wheat flour – 1 cup. Milk Powder – ½ cup. Baking Powder – 1 teaspoon. 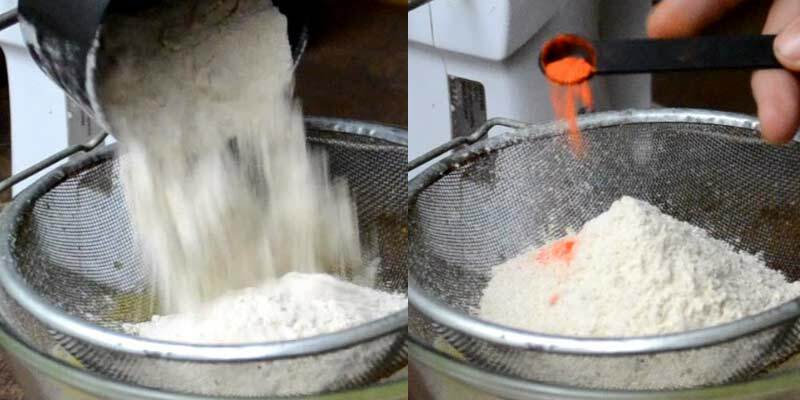 Baking Soda – ½ teaspoon. 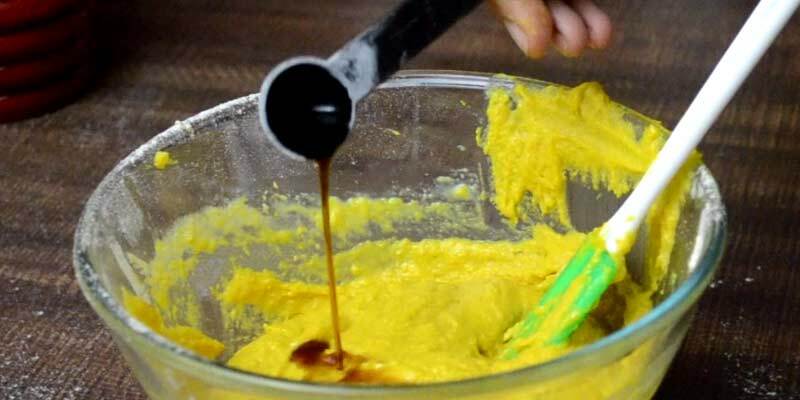 Mango Pulp – 1 cup. Vanilla Essence – 1 teaspoon. Chopped Almonds – ½ cup. Food color (Yellow) – 1/8 tsp (optional). Gather all the things required to the counter top. Preheat oven to 180 deg C for 10 minutes. 1- In a deep bowl, take 1/8 cup melted butter and add ½ cup granulated sugar. 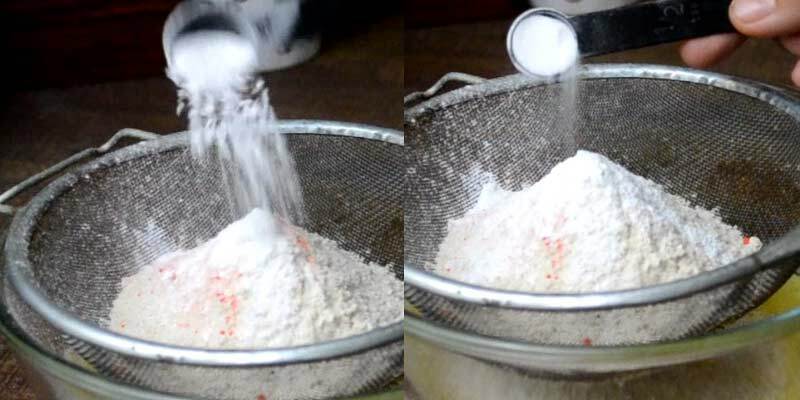 2- Add 1/2 cup milk powder and 1 tablespoon milk, Beat the mixture till it becomes fluffy. It will take approx 3-4 minutes. 3- Now add 1 cup mango pulp and beat the mixture again for approx 2 minutes. 4- Sieve 1 cup wholewheat flour, 1 tsp baking powder, ½ tsp baking soda and 1/8 tsp yellow color (optional). 5- Add ¼ cup milk and mix well. Do not over mix. 6- Now add 1 tsp vanilla essence and mix it in the batter. 7- Grease the muffin moulds using oil if required and add 1 scoop batter in each muffin mold and garnish with chopped almonds. 8- Bake the muffins at 180 deg C for 15 – 20 minutes or until a tooth pick inserted comes out clean. 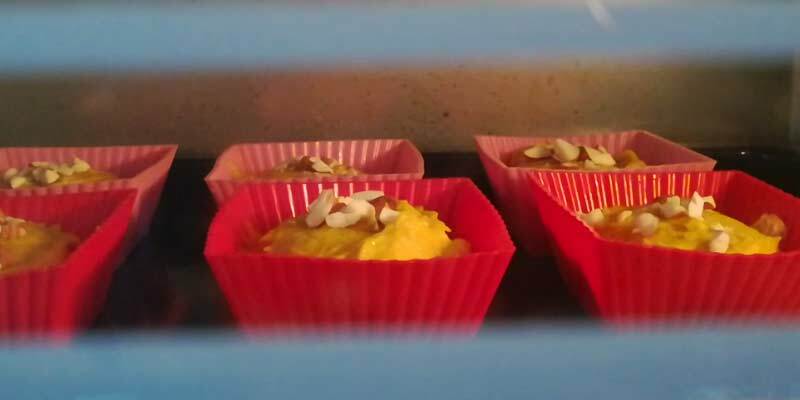 9- Our Eggless Wholewheat Mango muffins are now ready. Cool and store them, Keep good at room temperature for 3-4 days. – In a deep bowl, take 1/8 cup melted butter. – Add ½ cup granulated sugar, 1/2 cup milk powder and 1 tablespoon milk. 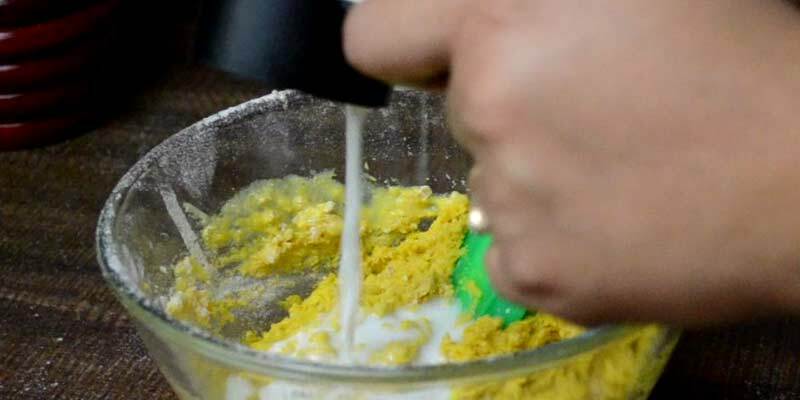 – Beat the mixture till it becomes fluffy. it will take approx 3-4 minutes. 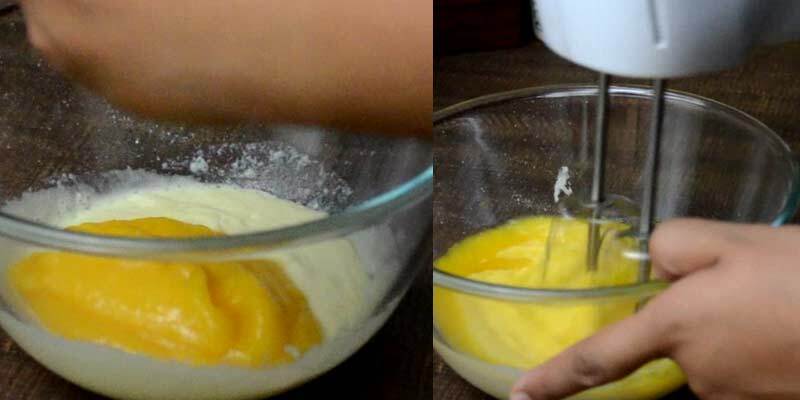 – Now add 1 cup mango pulp and beat the mixture again for approx 2 minutes. – Sieve 1 cup wholewheat flour, 1 tsp baking powder, ½ tsp baking soda and 1/8 tsp yellow color (optional). – Add ¼ cup milk and mix well. Do not over mix. 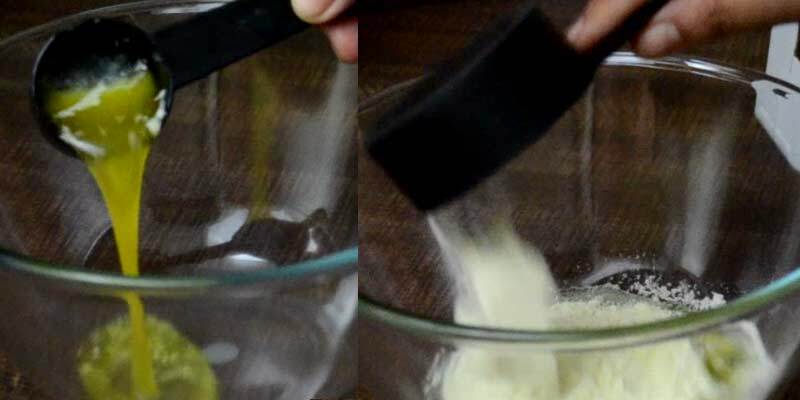 – Now add 1 tsp vanilla essence and mix it in the batter. 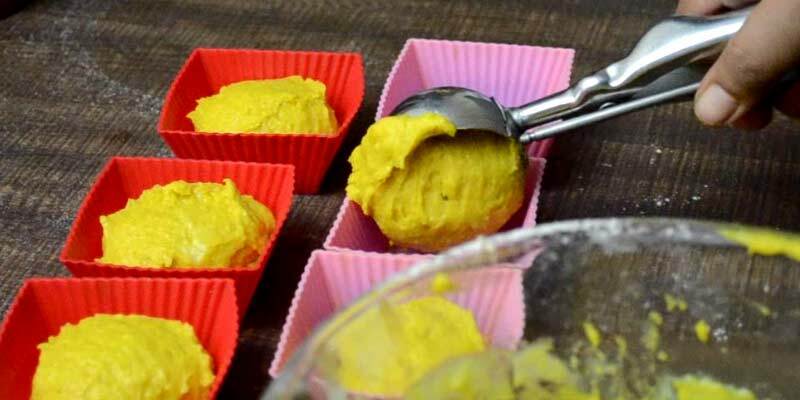 – Grease the muffin moulds using oil if required. – Add 1 scoop batter in each muffin mold and garnish with chopped almonds. – Bake the muffins at 180 deg C for 15 – 20 minutes or until a tooth pick inserted comes out clean. – Cool and store them, Keep good at room temperature for 3-4 days. 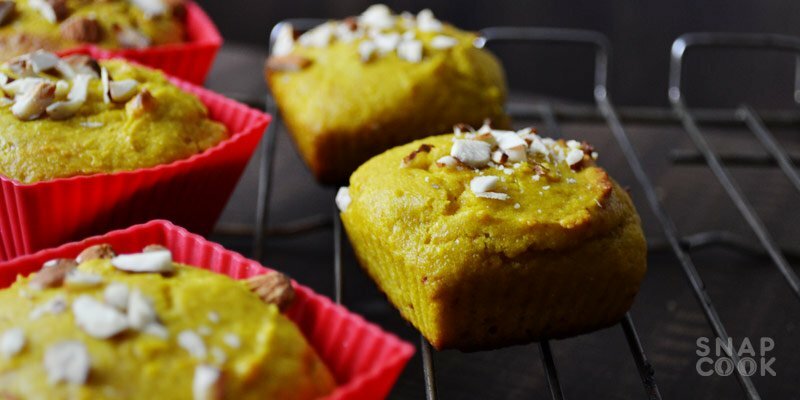 Our Eggless Wholewheat 12- Mango muffins are now ready.